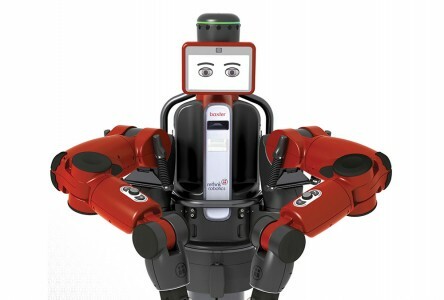 Yesterday was the launch of Rethink Robotics’ Baxter shop assistant robot. Many reporters, including myself, saw Baxter at Rethink’s headquarters in Boston in the past two months but were embargoed from writing about it until today, the launch date. Markoff’s story uses everyday language and is directed toward a wide audience – the kind of multi-layered audience, multi-interests audience unique to The NY Times; the Spectrum article is for engineers and roboticists. As an aside, Markoff’s article makes me ever more aware of the difference between a blogger/writer and a paid reporter from a reputable news source. John’s article made me wish I could write like him. I saw what he saw, got the same demo, played with the machine similarly, heard the same details. But I came away disappointed. John saw, as I did, that both arms don’t work together. He wrote that they will in the next version. I couldn’t imagine them bringing the product out without the arms working together (although they are aware of each other’s location and can avoid hitting itself). John saw, as I did, that it was big but he just described it as a 9′ span that, with the stand, brings Baxter eye-level with a standing worker. I saw it as big and clunky. John heard, as I did, that the price was $22,000 yet Brooks had been touting an affordable cost of less than $15,000 for a long time and cited polls that said that the price point for new shop tools was $15,000 or less. John just wrote the facts and let it go at that. We both saw that the grasping mechanism was a two-fingered plastic device and heard that, in the future, third party mechanisms could be quickly retooled to enable Baxter to do different tasks. I thought this was an awkward solution and found that Baxter could only lift 5 pounds and didn’t have enough torque to push/screw in a screw which, in my opinion, would be a necessary task for any shop assistant. John just showed what it could do with it’s two fingers. John described the need of small shops to augment their workers with robots which can do the dull, repetitive parts of their daily work much easier, thereby freeing up the worker to do higher-level tasks. But he didn’t indicate that this version of Baxter is far away from offering that capability. Nor did he talk about other promises and expectations missing from this launch, namely an app store where Baxter’s training can be transferred to other places where other Baxters are installed. We both saw that Baxter’s speed was slow and its precision not too precise but John just reported what he saw; I wondered how long it would take to speed up the processing and enhance the mechanisms to be more precise. I could go on with the comparisons but, bottom line, John Markoff deserves to work for the NY Times because he reports things as they are. Opinion and spin are left to bloggers and PR people. Markoff only writes a robotics story every month or so; Ackerman and Guizzo write every week or so. But every day there are hundreds of stories that need sifting to see whether they fall into News or Views and if News, whether the article is applicable for our readers as they do as we do: track the business of robotics.